Spaghetti is the ultimate fast food. I don’t know how Heinz ever thought they could get away with putting it in a tin, mushy like baby food with a sickly sweet red sauce – it is so easy to make, why did they bother? Back in 1950 when my parents first arrived in Australia, it was hard to find dried spaghetti (I imagine the tinned variety was more common). Amazingly they managed to find some packets of spaghetti a few weeks after arriving when they were staying at the migrant camp in Bonegilla. My mother tells me that they went on a day trip to a nearby town, Albury and found some spaghetti (the dried variety) in a shop. The food in Bonegilla was notoriously bad so they bought the spaghetti and took it back to the camp. Mamma tells me she cooked it on a camping stove and meat sugo to go with it. As you can see from the photo below, they ate it seated on a picnic rug in a field. This was probably their first meal of spaghetti in their new homeland. 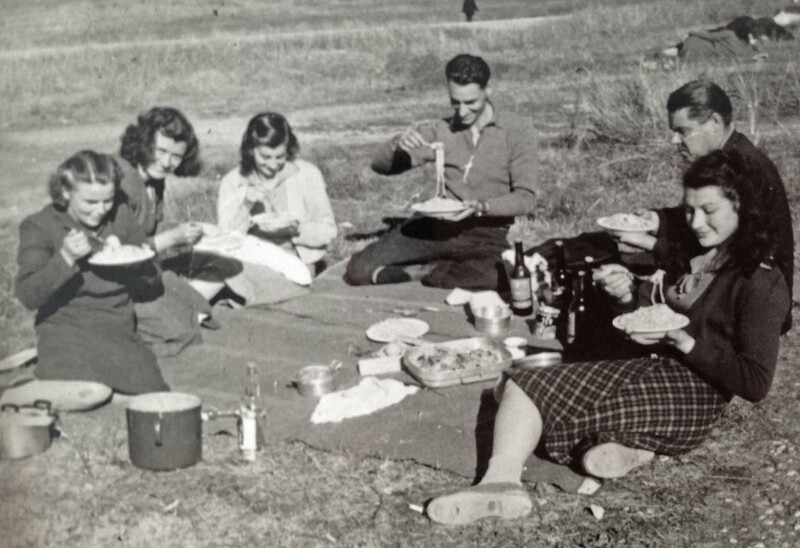 Fast food in the Australian countryside in 1950 – italian style. The brand I choose depends on the shape of the pasta. As far as spaghetti goes, you can’t beat Barilla. If I can’t find Barilla, I buy De Cecco. And it’s not just spaghetti – there are linguine (flat spaghetti), bucatini (spaghetti with a little hole in the middle), vermicelli (thinner spaghetti, it literally means little worms) plus different sizes of spaghetti. I generally buy De Cecco spaghetti no.12 or Barilla no.5. Cook pasta in plenty of water. The general rule is about 5 litres (or quarts) of water in a large pot for 500g (half a pound) of pasta. It does not have to be precise but less water means that the starches in the pasta that are released don’t distribute as evenly so can make the surface of the pasta too gluey. 4. When do you add the spaghetti? Add it when the water is a rolling boil. Drop in the spaghetti, wait until it starts folding, give it a stir and then put the lid back on and allow it to come to the boil again. Then take the lid off, give it a bit more of a stir and then cook it until it is “al dente“. And do NOT put oil in the water (which some people do to prevent it from sticking together) because the oil will prevent your sauce will also not stick to the cooked pasta. Pasta will not stick together if you have followed points 1,2 and 4. 5. How much pasta per person? The general rule for the amount of pasta to eat is 75g (2.6 oz) per person for an entree serve and 100g (3.5 oz) for a main meal. 6. Al dente or not? Al dente describes the texture of the pasta and means “a bit of bite” (or hardness) in the centre of the pasta. It really is up to you how much al dente you like pasta. I remember my father liked pasta less “al dente” than my mother, which means that someone is always not quite happy with its texture! Barilla, for example, gives two cooking times on its packet of spaghetti no.5 – ten minutes for “al dente“, otherwise 12 minutes. I suggest tasting it to see what you prefer at the ten minute mark. Drain the pasta in a colander but NEVER rinse it with cold water as it removes the starch and your sauce will not stick to your pasta. In some dishes, like pasta with pesto, some of the salty cooking water is reserved and tossed in with the pasta. It helps bind the dish together as well as giving it a bit more liquid, which is needed when you have a drier sauce. The recipe below is an old favourite because it is quick (under 30 minutes and it is on the table) and it is made from ingredients that I always have in the fridge or the pantry. Fast food Italian style. Buon appetito! Cook the guanciale on medium to low heat in a small non-stick frypan. In the meantime, prepare the other ingredients. Put your pot of water on the stove and bring it to the boil. After 5 -7 minutes when the cured meat is starting to brown, remove it with a slotted spoon and set aside. In the same pan, add a splash of olive oil with the garlic and chilli. Cook for a few minutes until fragrant then add the tomato and the pinch of sugar if using and simmer on medium heat. By now the water for the pasta should have boiled so add the pasta and cook (using tips above) until cooked to your liking. Just before the pasta is cooked, add the browned guanciale to the tomato and stir through. Taste and add salt if needed. Drain the pasta and place on warmed serving plates. Spoon on the sauce and added grated pecorino or parmesan cheese to taste. What a great photo of your parents. How brave those people were to leave their homes and move to the other side of the world. My grandfather left Finland in 1912 to come to Australia, one of the first Finns to do so. We should be grateful to them for our wonderfully diverse society, and especially to Italians for bringing their food. As a child I loved that awful tinned spaghetti…I wouldn’t touch it now. Does it still exist? Your grandfather was also brave to travel so far away in 1912- what a strange place Australia must have been for Europeans at that time. Tinned spaghetti does still exist – I checked before writing the post. In 1950 you used to buy olive oil from the pharmacy (not a shop that sold food) – so at least some things have changed! I love reading about your parents, and that shot is just wonderful. What a treasure. This dish is like coming home. When my dad took over cooking duties, or if he just wanted “a little something” my dad, it was either Pasta Fazool, Aglio e Olio, or Amatriciana. Plain and simple. so to speak. When we were teenagers we used to say that dad was into “fast food” long before McDonald’s ever rolled into town. I do not know how it is for you, but as the years pass, these dishes and recipes mean more and more to me. After my very long absence from the internet, everyone’s blogs, and the food world, it is indeed a pleasure to see food like this. I hope all is well with you and yours. Alla prossima! So true! I cringe every time I (far too frequently) hear people talking about buying canned or bottled tomato sauce. There is nothing easier, and the difference so profound. Wonderful pics, old and new. I banned my husband from buying tomato sauce when we got married – told him I wouldn’t have it in the house and that I could make it better. Well he won’t eat the bought one now – though I won’t tell you how dismayed he was at the time! I really love your photos! They are GREAT! Beautiful old photo! And, very useful notes on cooking pasta. Great recipe – one I make frequently along with spaghetti with good EV olive oil, anchovies and chilies. All great advice—and a great choice of pasta, a stand-by in our house that never fails to bring back memories of our years in Rome. If you ask me, canned pasta is like instant coffee—practical if you happen to be a soldier in wartime but otherwise useless! I always love the old photos you post and accompanying stories – you are so lucky to have those. Who took these and managed to keep them? Lovely post. Lovely story and great photo! I often make spaghetti when I have a little ingredients and haven’t been to the greengrocers that week. I love how you can add a little bit of this and that and as long as you have the basic ingredients, you can make alterations too. I usually use diced onions and minced garlic in my sauce but I noticed that you only use garlic. Is onion a faux pax?